There are so many things to remember about Paris. The ubiquitous baguette sandwiches, (why can’t we experience this bread anywhere on our continent?) walks along the Seine at night, jaw-dropping historical architecture at every turn, the effortlessly attractive Parisiens and Parisiennes, the incredibly efficient Metro. But a handful of moments during my two weeks as a member of “civil society” at COP21 are etched in my mind. Environment Minister Catherine McKenna endorsed the 1.5 degree warming target, a target essential for (but not guaranteeing) the survival of small island nations who are dealing with sea level rise which threatens their very existence. This move by Canada put us out in front of the U.S., a heartening signal after years of the Harper regime’s excuses that our policies must mirror those of our powerful trading partner. What does it mean for our work? The 1.5 degree warming goal is a stated “aspirational” goal. The goal is non-binding, and the treaty does not include emissions targets or carbon pricing. We knew going in that Trudeau’s plan would be to set targets in consultation with the provinces in the 90 days post-Paris. So where does this leave us? Working with provincial and territorial leaders, city mayors and indigenous leaders to coordinate efforts. Scientists agree that to come near such a target, 85% of known coal, oil and gas reserves must stay in the ground. Even when we were talking about a 2 degree warming target, Canadian and American scientists were calling for a moratorium on oil sands development. With future warming already locked in by the fossil fuels we’ve burned so far, meeting that 1.5 degree goal means no new oil and gas infrastructure, and an immediate end to fracking. The coming weeks and months will illustrate whether our leaders can back up their promises with the swift and decisive action scientists are calling for. Secondly, First Nations and municipalities have shown incredible leadership and responsiveness re action on climate. Trudeau’s stated objective of working with local leadership could be a huge boon to our movement, as citizens have more opportunities for direct access and input at the local level. If the feds actually start to pay attention to our local leaders, there is good cause for optimism. Now more than ever, citizens must hold our leaders to these admirable goals. A huge challenge? Absolutely. But if the Trudeau government is serious, we can hope to experience a seismic shift in our ability to affect change. In a packed session including a panel of labour leaders from Unifor, the CLC (Canadian Labour Congress) and the United Steelworkers entitled “One Million Climate Jobs”, Minister Murray called for a revolution in jobs, housing, and the environment. Together, the panel painted the picture of a “just transition strategy” supported by workers, employers and governments, creating 1,000,000 new jobs in housing and energy retrofits, renewable energy projects, public transit and high speed rail, while massively reducing GHGs. A new alliance of labour unions and environment, youth, public interest, faith-based organizations and First Nations — the Green Economy Network — is inspirational. If we are to affect change on a global scale, we need public policy which will work from the top down — but bottom-up momentum from grassroots groups as well as labour is equally important. This approach is in line with the Leap Manifesto, which calls for a shift to clean energy coinciding with a reduction in inequality. I was struck by the common ground between what the Green Economy Network is envisioning and that which has been laid out by Naomi Klein and her panel. Our role as organizers will be to focus more fully on collaboration. We need to find ways to support the initiatives of our allies in this movement. As illustrated by the SUNCOR mechanic, the “us and them” mentality will no longer serve us. We are all in this together. “We are experiencing a wake-up call, both for our internal decision making protocol and our global decision making protocol. Climate change asks us to look really deeply at what our values are, and these are the kinds of discussions that are not happening inside COP21”. As the majority of household purchase decisions are made by women, Sally emphasized the inherent effects of consumerism, the need for personal responsibility, and the imperative of changing our cultural narrative. In contrast to examining our excessive shopping and consumption habits, other WECAN speakers took the podium to document how it is women who are on the front lines of climate change, comprising 80% of climate refugees since 2010. In so-called “developing” nations, millions of women hold the primary responsibility for providing food and water for their families. Indigenous women and women in the Global South who have a more direct relationship with nature and primary resources for their physical survival are being severely affected. And firsthand accounts of the rise in prostitution and sexual violence in communities impacted by large scale extraction activities (e.g. “man camps” in the fracking fields of North Dakota) was devastating to witness. As someone said recently, it’s time for gender equality “because it’s 2015”. To me, this infers both equal opportunity and equal responsibility. As one of the privileged women Sally refers to, I am inspired to encourage others to use our unique leverage to support and push for local economies, renewable energy, and decreased consumption. At the national policy level, we now have a cabinet that is 50 per cent “privileged women”. A study of 130 nations showed that countries with a higher number of women in parliament were more likely to ratify environmental treaties. A majority of Dogwood volunteers and organizers are women — women skilled at sharing their cultural narrative, organizing community forums, and taking a stand in countless ways to protect their communities. Sometimes working shoulder to shoulder we can feel insignificant in the face of what we are trying to achieve. But having heard from those on the frontlines of climate change, it is clear to me that our access to power is, in contrast, there for the taking. And take it, we will. e for jet-lag, as they put in 16-20 hour days attending sessions, labouring over early versions of the treaty, doggedly documenting every possible salient detail, researching and writing, tweeting and blogging and pressuring our ministers and others for audiences and meetings. 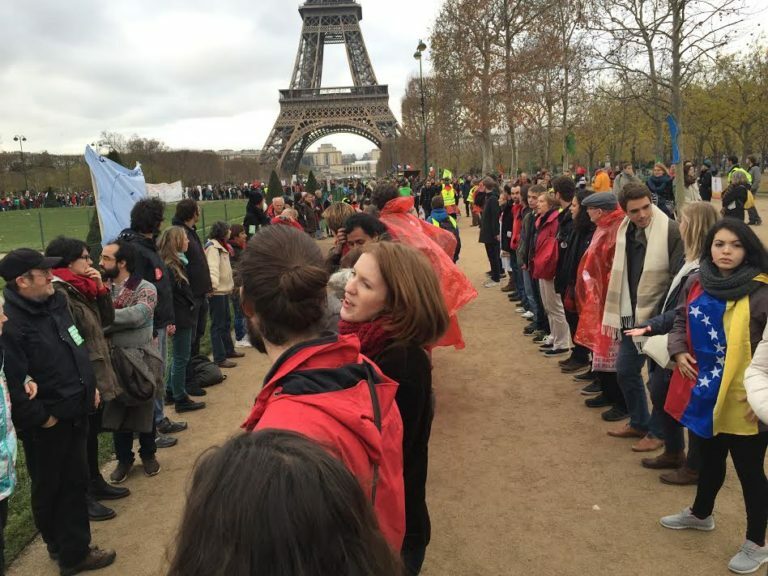 With a state of emergency in Paris stifling any large-scale marches or rallies, youth delegates came up with impromptu mini-actions to garner attention for important issues. Their creativity and endless energy was incredible. These kids are some of our best and brightest — young people with degrees from our best schools, painfully aware of the pressing realities of our times, and yet somehow armed with the grace to continue in their quest for solutions to a crisis of which my generation was blissfully unaware at their age. Here it gets personal. How do we live with ourselves if we fail to support the efforts of these amazing young people, the future of our country? The answer is, we don’t. I think the photo that my daughter and her friends orchestrated says it best… to our leaders, and to us all.